This objection assumes that all Syrians are Muslims and therefore Islamic countries should be the ones to offer sanctuary. However, 10% of the population, in the Syrian Arab Republic, are Christians: approximately 2.3m people. With the presence of ISIS and al-Nusra in Syria, Syrian Christians are especially vulnerable to persecution and violence. Consider the option of fleeing to Saudi Arabia from a refugee’s perspective. Why would a family, or individual, fleeing war, terror and persecution wish to seek sanctuary under an autocratic, sometimes brutal, State sponsor of Islamist terrorism? A nation that abuses its Kenyan and Asian migrant workers – circumstances that are not unique to Saudi Arabia, but endemic throughout the Gulf region. It doesn’t give the impression of a welcoming haven for refugees, and Syrians know it. Also, with Jordan now closed to new Syrian refugees, the only feasible land route to the Gulf States is through…Iraq. A nation afflicted by its own nasty war, and the destructive presence of ISIS, cannot offer safe transit through to Saudi Arabia. The Syrians who made it to Iraq before the conflict with ISIS emerged are now trapped in Iraqi Kurdistan. From the outbreak of civil war, in 2011, Saudi Arabia and Kuwait have contributed more to the International Red Cross (which is very much THE charity operating in the region and supporting Syrian refugees) than both France and Italy, combined. These two European economies are roughly double the size of the Kuwait, Bahrain, Qatar, UAE and Saudi Arabia, collectively. Until recently, Saudi Arabia was the largest donor to foreign, on a per capita basis, in the entire world, though this was predominantly to Muslim countries. The UAE currently donates the most in foreign aid as a proportion of its GDP (1.17%). The UAE delivers aid through through many entities, but 80% of its foreign aid spending is through the state and this alone equates to over $4bn. 2015 is the second year running that the UAE has been at the top of the ‘foreign aid’ list. The reason you are not likely to see these figures is because the UAE, and most Gulf states, are not members of the DAC (Development Assistance Committee). A 28-member forum to discuss issues surrounding foreign and development. Most publications of international ODA (Overseas Development Assistance) includes only those countries who are members of DAC. In 2013, Qatar donated over £500m in foreign aid. The country focuses on the Arab world and Syria has received a huge chunk of this funding (over £400m in 2013). The country is committed to investing in humanitarian concerns throughout the Middle East and North Africa. The Gulf countries also donate through their membership of OPEC, as the OPEC Fund for International Development has become a significant donor to the Red Cross in the past two years. A comprehensive 2014 report on development aid provided by the UAE can be found here. Wealthy Arabs also account for the sizeable private donations received by the IRC. Prince bin-Talal of Saudi Arabia has committed his $32bn fortune to charity over the course of several years. It is important to remember that one of the five pillars of Islam is ‘alms giving’: charity is a facet that underpins expression of the Islamic faith, much like it is in Christianity. The President of the UAE, Khalifa bin Zayed Al Nahyanm, has donated $460m, throughout his life, to humanitarian concerns from his own personal wealth. It is no surprise that the government of UAE is significantly oriented toward foreign aid and development. This may also surprise many: There are 100,000 Syrians currently living in UAE. However, they do not show up as refugees living in the UAE on any UN agency report. This is because these Syrians have been given FULL residency visas and so do not have ‘refugee’ or ‘asylum’ status. Arab leaders are sympathetic to the dire situation Syrians find themselves, and the news coverage is unending. They have further proven their concern for Syrian civilians by donating huge amounts of funding to humanitarian aid. Kuwait is the third-largest donor ($300m) to the UN’s Syria Response Fund, for example. In 2015, Kuwait has donated over $100m, second most after the US, to UNHCR efforts. Ordinary citizens in Gulf nations have also expressed opinions that favour opening the door for more Syrian refugees. (the Arabic hashtag “Arab Conscience” has been trending on social media). A simple answer is that many refugees have family who reside in Europe and have likely helped finance their escape from Syria and the Middle East. These relatives can offer smooth transition in a foreign, with their local knowledge and economic independence. Language is another reason. Having knowledge of your host country’s mother tongue will be beneficial when attempting to settle your family and build a life, either temporarily or permanently. This consideration is the fundamental rationale as to why the UK attracts Eritreans and Syrians more than any other nationality that is listed by the UN as ‘persons of concern’. A more complicated explanation takes account of previous attempts to claim asylum in European countries. The Balkan countries, and those of Central Europe, invariably have hostile attitudes toward the refugees: Hungary, Czech Republic and Slovakia express particular opposition to any influx of asylum seekers and have already opposed the EU’s attempts to introduce a refugee quota system. Nations such as Hungary have a remarkably high propensity to reject asylum applications – usually for political reasons rather than on the merit of the applicant. From a total number of 5,445 decisions made by the Hungarian government, in 2014, on granting asylum, 4,935 were rejected. The UK rejected over 60% of applications in which it made a decision. This figure had been even higher in previous years before the unfair and controversial Detained Fast Track System was scrapped by the courts. Those who have their applications rejected face deportation. It, therefore, should come as no surprise that we are seeing many refugees eager to cross the northern frontiers of countries like Hungary in order to reach Austria and Germany – countries that have changed radically their policy toward refugees in 2015. Why take all those risks and bankrupt yourself only to be turned away at the first opportunity? 4. “99% are economic migrants who want to come to England and claim benefits”. Anyone would think that there has not been a devastating civil war raging in Syria for 4 and a half years; conflict in Iraq; violence in Afghanistan; repression and torture in Eritrea; and an ongoing war in the Darfur region of Sudan for over 12 years. The vast majority of those seeking asylum in Europe come from seven countries whose nationals are all recognised by UNHCR as ‘persons of concern’. Refugees making their way to EU countries are predominantly from Syria, Iraq, Afghanistan, Eritrea and Sudan. (40% are from Syria, alone). Eritreans and Syrians are two of the top three nationalities who are attempting to claim asylum in Britain. But yet their number is only in the low thousands. There are 56 million people in the world who have been forcibly displaced and the UK is home to less than 0.5% of them. Of the 14m who are refugees (i.e. those who are not internally displaced within their own country) the UK is still home to less than 1%. The fact is the majority of refugees do not wish to claim asylum here, and this is a trend that is not unique to Syrians. For example, of the nearly half a million who have fled violence in DR Congo over the course of its bloody civil war, just 118 applied for asylum in Britain, up to the year 2011. The UK, on the other hand, received a total of 32,000 applications: fewer than Italy, France, Hungary and Sweden. Therefore, the number of asylum applications made to Britain, equates to just 2% of all asylum applications made in 2014. The number of asylum applications to Britain in 2015 – figures from January to June – has been less than 10,000: a figure that is fewer than in both Belgium and Austria (to add to the list of countries above). Turkey (in its Asian territory) and Pakistan have, by far, the largest refugee populations in absolute terms (1.9m and 1.5m, respectively). 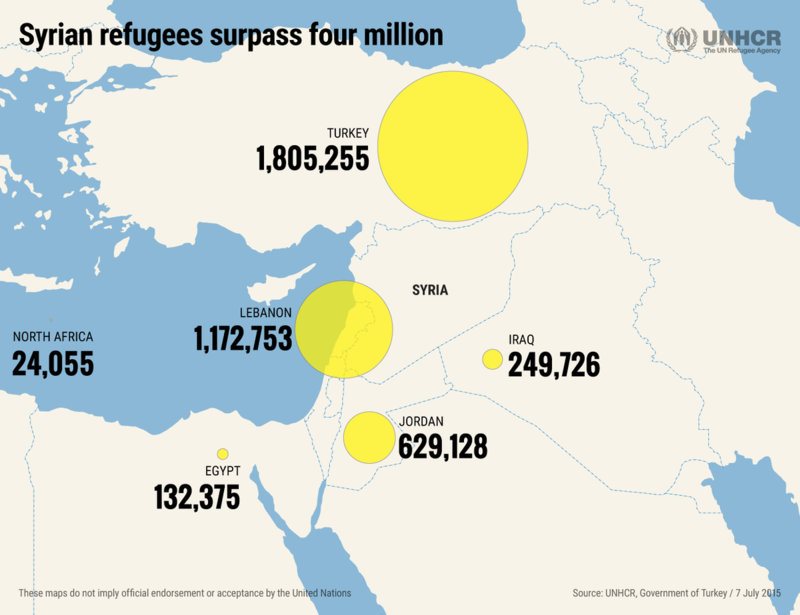 Lebanon and Jordan host the most refugees relative to the size of their populations. In Lebanon more than 1 in 4 is a refugee, and the Za’atari camp in Jordan is now the country’s fourth largest city. Iran, Ethiopia, Uganda, China, Chad and Kenya all have received more refugees (this is total refugees not just Syrians, of course), than the entire Continent of Europe. Almost 60% of the world’s refugees (who are not IDPs) survive inside the countries mentioned above. On the final point of refugees wishing only to claim benefits in England, a clear and succinct response is all that is needed to rubbish that claim. First of all, 50% of all Syrian refugees are under 18 (an unprecedented proportion of a refugee population). Of those who are 18-59, most are educated and/or skilled and have worked throughout their lives. The idea that they would make the long, perilous journey, where they are exploited by people traffickers and abused by unsympathetic countries and their populations, only to give up their autonomy and self worth so that they can sit on a sofa in Clacton all day and watch Jeremy Kyle, is absurd. Not to mention the fact that these human beings come from a land where if you don’t work, you don’t eat. The presence of social security in their homeland is minimal if not non-existent and they have no knowledge of the British welfare state. Oh, I’m sorry, I didn’t realise fleeing war and persecution was solely the inalienable right of the impoverished and those who are deficient in handheld technology. Would it be fair if, during a time of civil war in your country, you were prohibited from fleeing because you own a phone and a pot to piss in? The majority of adults who are able to leave Syria are educated and skilled, like this Syrian radiographer, and his bank employee wife, profiled by the BBC. Those lower on the socioeconomic scale, who more accurately represent our media-fuelled notions of what a poor foreigner looks like, are the 7.5m who remain internally displaced within the utter hell of the civil war. Furthermore, many refugees have financial help from family already settled in the West. This is what many have been doing for a long time. It’s why it has taken over four years of war before the refugee crisis has manifested itself north of Greece. The current refugees who are trekking along the motorways and country roads of Europe have not arrived fresh from Syria. Fully intending to return as soon as a safe opportunity arises, they remained in their area of displacement (camps in Jordan, Lebanon, and Turkey) – as 86% of all displaced people in the world do – so that they could make their way back to their homes swiftly in order to rebuild their shattered lives. However, the mood has changed in the camps of Jordan, Syria and Lebanon. Conditions within the camps are deteriorating rapidly. Many have been operating for nearly five years and the resources are under immense strain. With growing instability and economic fragility creeping further every week, for all three countries, their capacity for generosity is in decline. Lebanon is threatened by a renewed outbreak of civil war: social tensions are on the rise in a nation where over 1 in 4 is a refugee. The refugees, themselves, are plunging further into poverty, and beginning to suffer from malnutrition and ill-health now that rations are depleted and medical supplies are becoming more scarce. There are also family concerns over their children’s educations. For those who are not in school in Lebanon, Turkey or Jordan, the growing time in which they are out of education is going to have detrimental consequences on their future job opportunities and livelihoods. The refugees are looking toward alternatives. In Jordan the situation is even worse. Like Lebanon it has closed its borders to more refugees as it faces uncertain times regarding its internal security and its economy. The country is experiencing severe water shortages, and drops in aid support from the international community. The refugees here are descending into abject poverty and forced to leave the camps and enter the surrounding urban areas to live in abandoned or dilapidated buildings with no running water or sanitation. Two-third of refugees here are estimated to believing below the poverty line. One third of refugee children are not enrolled in school in Jordan. Of those who have been forced to relocate into the surrounding urban areas, half of the households have no heating and many have unreliable electricity supplies and no functioning toilet (which is particularly a problem for young girls and women). It was recently reported that UNHCR had been dealt a 10% funding blow (only 37% of the necessary funding to the UN Syria Response Initiative has been delivered), which they warned would have irreversible consequences for refugees in their camps. Clinics are closing, rations are being cut and people are not receiving enough caloric intake to remain nourished. The camps are at breaking point and more and more Syrians are fleeing to the cities and, increasingly, toward Europe. 7. “But where are all the women and children, especially in Calais, clearly the refugees are men looking for work? Given the uncertainty surrounding a long journey to a new continent travelling along unfamiliar territory, it is only reasonable that many of the men, who have wives and families, take this risk on their own and try to establish asylum in a safe country before making arrangements for their spouse and family to join him. It also reduces the cost of transit to Europe and precludes the anxiety over struggling to provide food and water for your children. At least at the camps you know they well be safer, better fed and have limited access to medical care. The high number of young men, particularly in Calais’ ‘Jungle’ camp, is evidence of refugees fleeing conscription in the brutal Eritrea, where children as young as 14 can be forced into military service. In the case of Syrians, parents encourage their young adult sons to flee the country in order to avoid being coerced to fight for the regime or the rebels, and to evade capture and execution by ISIS or the Al-Nusra Front. Others, who have already be forced to fight for pro-Assad forces, have deserted and sought refuge outside Syria. After fighting for so long they have become disconnected from their families and make the journey alone not even knowing the fate of their loved ones. However, it is important to remember that the demographic breakdown of refugees camped in Jordan, Lebanon and Turkey is split almost right down the middle in terms of gender. 50.5% of refugees, in the Middle East and North Africa region (where 95% of Syria’s refugees live), are female and 52%, overall, are under 18. So there are not more adult males among the 4 million refugees. It is just that many men have made the reasonable decision not to expose their wives and children to any additional or unnecessary risk. To begin with, refugees, while their application is under consideration, are forbidden from engaging in employment and are forced to live off paltry State support, which is barely equal to the value of the JSA benefit payment. Women and children are particularly at risk from violence and are likely to sink into poverty and destitution without adequate State or local authority assistance. Refugees do not ‘jump the queue’ for social housing, they also have no say in where they live. Quite often they are housed in ‘hard to let’ properties in run down, often dangerous, urban areas that already experience social friction. Again, this places asylum seekers in a vulnerable environment. Syrians granted asylum will also not be taking away ordinary jobs from those unskilled Britons who rely on menial, minimum wage work to scratch out a living. As mentioned above, the adult Syrians are educated and skilled and offer great value to the labour market and the economy. The UK’s health service currently employs 1200 doctors with asylum status. It is proven to be more cost-effective to retrain a foreign medical professional, so that they can be absorbed into the NHS (£25,000), than to train UK nationals from day 1 of medical school (£250,000). Scotland is already considering plans to fill vacancies in medical roles with Syrian refugees who are trained in medicine. “But shouldn’t we train and spend money our own people”. Yes, of course, but this does not mean we cannot harness the skills and knowledge of educated Syrians for the mutual benefit of the refugee and the national economy. The NHS is already wholly dependent on immigrant personnel to keep the monolithic health care machine running. Syrian medical professionals would merely be supplemental to our native and legal migrant stock. An article in The Independent by a professor of Migration research at UCL attempts to answer some of the common objections relating to immigration, specifically, but his findings are relevant to the current refugee situation. What is clear is that it is a question that needs to be considered at the local and regional level. Different counties and areas of the UK have varying capacities to take in a higher population and still sustain current living standards for the persons already living there. On the topic of immigration, in our case asylum, affecting joblessness, he is quite categorical in stating that a sudden spike in population often has no bearing on unemployment rates. When a quarter of a million Poles entered the UK in 20o4 and 2005, Professor Salt confirms that unemployment actually fell and that job vacancy adverts shows a small increase. Today, we are talking about just 20,000 people. The size of a modest university’s student body; a number that doesn’t even equate to one person in every town in the UK. The belief that such a small flow of people, over five years I might add, will register any negative impact on British society is quite comical. In fact, there is evidence to suggest that the reverse is true even when there is a large intake of refugees. One reason is their impact often leads to wealth and job creation as refugees are more likely to set up small businesses. Many refugees have become creative geniuses involved in the digital revolution. Steve Jobs of Apple, who was the son of a Syrian refugee, Sergey Brin of Google, and Jerry Yang of Yahoo, are all examples of refugees who have contributed greatly to their adoptive societies. This entry was posted in Britain, Charity, European Union, Foreign Policy, Humanitarianism, Humanity, Politics, Refugee Crisis, Refugees, UK, UN and tagged asylum, Britain, Britain and refugees, Britain and syria, british attitude to refugees, Cameron, charity, Civil War, Eritrea, EU, European Union, Foreign Policy, humanitarian, Humanitarianism, Hungary, jordan, Lebanon, middle east, refugee crisis, refugee policy in the UK, refugees, Sudan, syria, Turkey, UK, UK and refugees, UK politics, UN. Bookmark the permalink. I was party to all the negative comments about refugee’s the other day! it became a very embroild argument which I had to stop. I would have like to have sent this brillian artical to the person concerned but sadley i can not email it! Copy and paste the link and email it? This is one of the dumber pieces I’ve yet seen. “Helping you (sic) poor and vulnerable compatriots and assisting those overseas are not mutually exclusive.”… So if we spend a million pounds helping refugees, we can then spend that same million pounds on our own homeless? How? The local authority budgets for homes and hotels and hostels being requisitioned for migrants can hardly be spent twice. Re. Steve Jobs as the son of a Syrian refugee, you conveniently omit the detail that the Syrian in question gave Jobs up for adoption and was not involved with his life in any way. If there’s any family credit to be taken for Steve’s monumental contributions to American industry and human progress then logically it must go to the American family who bothered to raise him. The money for helping to resettle refugees is coming from DfID budget not that of local councils. It is also odd you call this “one of the dumbest” pieces and yet you can only isolate two things, among a 3000+ word article, with which you find fault. And even one of those objections proved to be grossly misinformed. Just because you can prove facts and counter balance arguments, doesn’t mean we should. Ok so you have made me think differently ‘slightly’ but what about all the reports of ISIS sending their ‘soldiers’ amongst the crowds of refugees? Can you please include that in your article too. That makes it all worth. I certainly can try. Will take a bit of research, though. I’m of the same opinion, it has made think slightly different. But this article was written before the worse of the crisis had happened. When the young men get here and settle they will bring the rest of their family over here later. So we are not talking 20,000 but a lot more. Also at the moment we are talking 20k but the way it’s going I fear it’s going to be many more. We must leave the EU so we can vet immigrants like Australia does on a points system, then at least the indigenous people will feel more confident with the new arrivals.